The merry birds are singing. Beside the banks that bound it. And oped the gate of heaven. 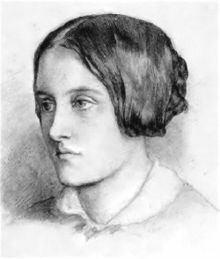 Christina Rossetti (1830 - 1894) was born in England to a family of great literary and artistic talent. A beauty who frequently modeled for her brother Dante and other respected artists of her day, Christina began writing as a child and published her first poem at eighteen. A kind-hearted woman who spent many years as a charity volunteer, Christina’s devout faith was often a central theme in the three books of poetry and four books of devotions she wrote during her life. Though her poems show up consistently in contemporary films, television shows, and musical compositions, her most familiar work is “In the Bleak Midwinter,” which, when set to music, became a beloved Christmas carol. Wonderful words to celebrate this joyous day. Happy Easter to all! Joyous voices indeed this beautiful Easter morning, thanks be to God, Alleluia! Hi Kevin--our church has that tradition in its Easter liturgy. There's a tradition among some Christians that they greet one another this morning by saying "He is risen," to which the expected response is, "He is risen indeed." This poem seems to fit well into such traditions, as does reading a gospel of Easter morning. Such a beautiful, finely-crafted poem.